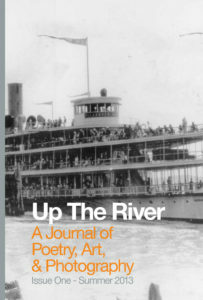 Albany Poets released the first issue of Up The River, a new journal of poetry, art & photography celebrating the best in the arts not just from upstate New York, but from around the world, in the summer of 2013. This first issue of the journal was the brainchild of local poets and artists Jill Crammond and Keith Spencer and was edited by Carissa Haberland, Mary Panza, and Thom Francis. The printing of this first edition of Up The River was made possible by a Community Grant from the Hudson Valley Writers Guild. For more information on the HVWG visit their website at www.hvwg.org. You can purchase your own copy Issue One from Amazon.com for just $10.00.